We made it to our apartment eventually (see Lesson 5) and were met by the owner Sylivia who showed us around. Nick was a little disappointed at first as he said it was not exactly what he was expecting and that it seemed quite far out of the centre of Como. After a quick freshen up we started to realise we really needed to get something booked as in 5 days time we had no where to stay and panic was starting to set in! So we grabbed the laptop and headed off to find some free wifi as our apartment did not have any (See Lesson Number 6). 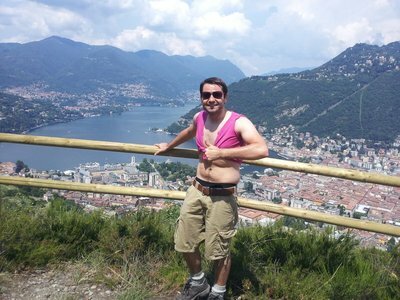 A 10 minute walk later we were faced with Como’s very impressive Duomo so Nick needn't have worried!. Friday we headed to the local market and stocked up on groceries (spent €25 which was much more expensive that in Spain - although this was for 5 breakfasts, 5 lunches and 3 dinners, so really should not complain too much!) which really tested my Italian before starting to explore Como properly this time. We took a long stroll along the front of the lake all the way around to Villa Olsa, where we had a quick nap in the sunshine listening to the waves on the lake lapping the shore, before heading back into the old town to mooch around the cobbled streets and soak up the atmosphere (and sunshine for Nick!). We finally got to go inside the impressive and imposing Duomo and were not disappointed by it’s beautiful stained glass windows and painted ceilings. On Saturday we accidentally slept in until midday (which I guess shows how tired we both were) but were up and about quickly. The previous day I had picked up a leaflet with some suggested hikes in the mountains of the National Park surrounding Como. We knew that back in the UK our friends were taking part in the Race for Life in support of the Breast Cancer Campaign, so thought this was the perfect way to spend the day and support them in our own way. The climb up the path was incredibly steep and unrelenting for a good hour on overgrown paths and clouds of mosquitos! After much grunting, sweating and looking very red faced (that’s me by the way, not Nick!) we reached the top and were rewarded by a stunning view down over the lake and the town. Sunday 23 June 2013 saw our one year wedding anniversary and twelve years of being together. We knew that we wanted to visit Bellagio as it is famous for being beautiful and very romantic, so what better day to go! We had been told about the various ferry but it was around €46 (return) which was too much for our budget, we then wondered if there as a bus which may be cheaper. We enquired at the tourist information and discovered you can, plus it takes the same amount of time and only cost €12 (return) - bargain!! Bellagio lived up to it’s reputation (no sign of Mr. Clooney though! ), and although it was very busy and full of tourists (mostly American) it was lovely to stroll around it’s winding streets and to enjoy views of Lake Como. 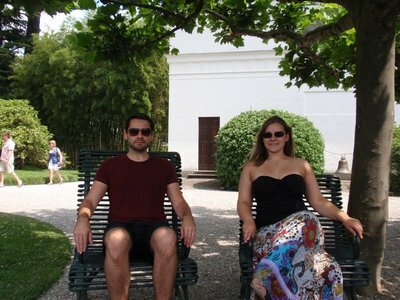 We treated our selves to some Gelatto which was surprisingly cheaper than we had seen it in Como, and then walked the short distance to Villa Melzi (€6 each) which sits right on the lake and has gorgeous gardens, we spent the rest of the afternoon relaxing and enjoying the sun - and simply being together. Once back in Como and freshly showered and dressed up we treated ourselves again to meal out to celebrate in style. After looking at a few menus trying to decide what we wanted (we even sat down in one and then swiftly scarppered when we changed our minds in favour of the place next door!) we finally settled on really nice, atmospheric restaurant and had delicious food (tricolore gnocchi, salmon raviolli, tagliete di manzo plus drinks for a total of €77 which completely blew our budget, but hey you only get to celebrate your first wedding anniversary once!). When we left the restaurant there was an amazing thunderstorm taking place with flashes of lightening brigtening up the sky and roaring thunder rolling and echoing of the mountains! Sadly we did not manage to make it all the way back to the apartment without getting a little wet, but once home we enjoyed watching it continue from our balcony and it went on late into the night. 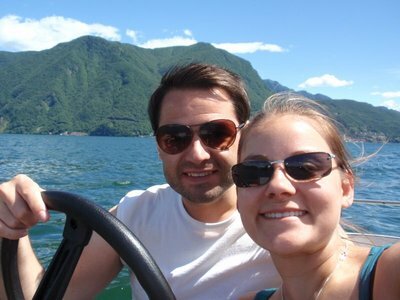 We spent our final day in Italy (for a couple of weeks at least) in...Switzerland! We took the 30 minutes train ride over the border to Lugano for the very expensive price of €71 return, but we both agreed it was worth it! btw if you decide to do this journey remember to take your passports as you'll cross boarder control and they will ask you for your passport, it only occurred to us the night before that we should take it. 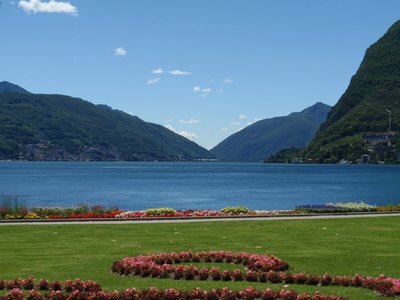 Lugano is stunning - nestled into the mountains curving around the shore of Lago di Lugano. We headed straight to the tourist information as we do everywhere we go and asked about what to do. 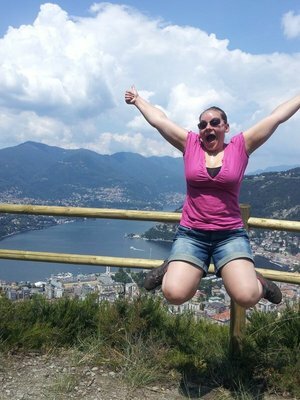 There are two mountains either side of Lake Lugano that you can get funicular railway's up. So we walked to the first one at the edge of town to find it was 46 Francs (£32) to go up so we decided to walk to the other side of town and when we got to that one it was even more expensive. We therefore decided to enjoy the art museums, as this seemed to be a very arty town (which I did not expect). They had painted an subway with blackboard paint and left out chalk so the public to do arty messages. Unfortunately for me but maybe not for Nick, it was Monday so all the museums we're closed as is the customer with Italy and apparently Ticino. Instead we ate our lunch in the beautiful park, mooched around and even hired a piccolo pedalo which was the cheapest thing we could find to do 8 Francs. Finally we chilled in the sun (well Nick was in the sun, I was in the shade with a book) till our train was due. The next morning we said goodbye to Lake Como and walked the 2.2km to the train station with our 4 stone backpacks (which I swear are getting heavier) to catch our trains to Bern.